Note: These files represent the current build state, and may contain more bugs than usual. Use at your own risk ! View extended debug /warning / error logging with the -console command line option or entry in the debug menu. Support for SC:R specific ramp doodads, and overlays in the doodad palette. Extended overlay options, located in the left bar. Terrain height display. Click for big. Extended terrain symmetry options, located in the left bar. Five-fold isometrical symmetry. Click for big. 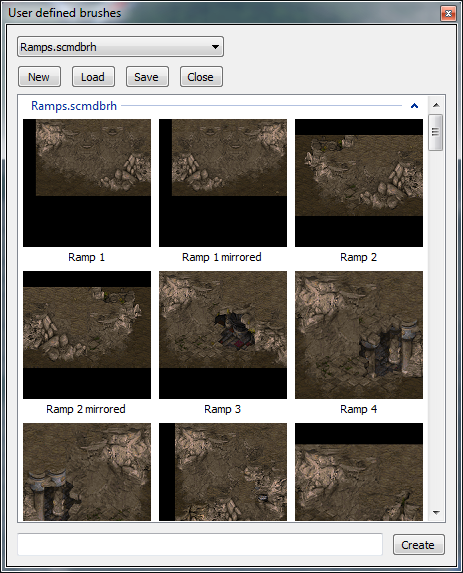 Custom ramps loaded from a user-defined brush file. Pathfinder region display and microtile height display. Click for big. Minimap display, terrain palette now stretch displayed images to fit available space. Hi-DPI / 4K display support. Donate to support hosting and development. 2019.04.17(W) Release candidate. Please report any bugs ASAP. 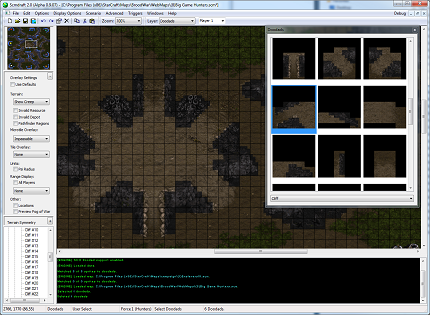 New: Automatically open a terrain palette when switching to tileset indexed mode. Internal code changes to cursor position handling. 2019.04.09(W) New: Implemented resizing the 'edit trigger' window in classic trigedit. 2019.04.03(W) New: Cut / Copy / Paste locations now includes the location name, and generates a unique name of the form 'Copy Of [original name] (n). New: Add a new unit collision/stacking setting, which enables placing units within the placement area of buildings but not within the collision box. Fix: Unit damage overlays were being removed too early when the unit/building had its health increased. Improvement: Remember the last configured debug log setting. Improvement: Display various menu item groups with radio buttons instead of check buttons. 2019.04.02(W) New: Units, sprites, and doodad sprites may not be cloaked instead of hidden to reduce visual clutter. Fix: Previous build swapped shift and control when multi-selecting, this has been fixed. 2019.03.31(W) New: Added the ability to cut / copy / paste fog of war in the fog of war layer. To enter this mode, right click while the normal brush is active. Ctrl + X/C cuts/copies the fog of war for the current player. Ctrl + Shift + X/C cuts/copies the fog of war for all players (In the fog of war layer. The cut/copy/paste layer always copies for all players). When placing, hold ctrl to place for all players (Again, only in the fog of war layer). To switch back to normal editing mode, change the fog brush size or re-select the fog of war layer. 2019.03.24(W) Fix: Jump when scrolling the tileset index window with excessively long custom tilesets. Improvement: Improve startup performance slightly. Improvement: Simplify game data loading and add stricter error checking. 2019.03.14(W) Fix: Pure sprite entries in the object tree now do not use the full path. Improvement: When filtering doodads / units / sprites in the cut/copy/paste layer, the corresponding items are no longer rendered. Improvement: Cutting in cut/copy/paste layer will actually delete the active selection now. Further improvements in fog of war copy paste. 2019.03.13(W) Further improvements in fog of war copy paste. The fog of war is not displayed in the brush palette, and display may be toggled in the custom overlay options. Additional internal implementation cleanup. 2019.03.12(W) New feature: (In progress) The Cut / Copy / paste layer will now also copy and paste the pre-explored fog of war. This may also be stored into predefined brushes. This will soon be expanded to be included in the preexplored fog of war layer as well. 2019.02.20(W) Improvement: When cut / pasting locations, their index will be restored if possible. Pasting locations will now also trigger the 'Upgrade location table to BW' query. Fix: Trigger edit UI now closes when enter is pressed. This may affect korean text IME editor, let me know if it does! 2019.02.13(W) Add ability to copy and paste locations. Note: this feature is incomplete, location names will not be copied, and location indices will not be restored during cut paste. (This means triggers will no longer reference the location correctly). Avoid a warning about CUWP slot verification when editing mission briefings. 2019.01.17(W) Fix: Swapping trigger conditions and actions did not work correctly in previous build (now taken down). Fix: Size of anywhere location still wasn't updated correctly on resize. New: Try to read the starcraft install dir from the windows uninstall data. Fix: Autopopulation in new trigger actions should now set last used sound length correctly. Text Trigedit: Massive amount of internal changes to migrate external plugin codebase to reuse scmdraft data structs. Please report any discrepancies. 2019.01.02(W) Fix: File browser in legacy autoupdater was not working in unicode port. Fix: Race condition in ref counting when COM interop was enabled. Improvement: Seperation of sound file reading and adding code. Improvement: Use fixed point instead of a floating point approximation in pathfinder. 2018.11.14(W) New: Implemented optional hiding of unit graphics, sprite graphics, and doodad sprite graphics. New: Refuse to save in SCM format if custom player colors are used. Fixed: Destert sprite category could not be selected as filter in the sprite palette. 2018.09.01 New: The string table editor (in map settings) now can display the table using briefing color strings. New: Map image export now can include the unit collision boxes or psi radius display. Fix: Fix a crash when attempting to display town locations with no minerals in the map. 2018.08.20 Fix: When resizing a map without an offset, the anywhere location was not being resized. Fix: Could not place units/buildings which touched the right side of the map. Fix: Avoid a crash if the system does not support DirectSound, and ensure the map sounds table works when directsound isn't available. 2018.08.02 Fix: When offsetting a map, locations were being moved by offset in pixels, not offset in tiles. Improve: When scrolling a map window with the keyboard (cursor or WASD), the contents of the brush will be placed if the mouse is pressed. New: Overlay option to display the 'town regions' which the AI uses to expand. This feature is not yet complete. If you notice differences to the expected areas let me know. 2018.07.24 0.9.07 Release Candidate ! Enable support for SC:R ramps, and SC:R specific maps. 2018.07.16 Internal sound string management changes. 2018.07.15 Increase size of trigger edit dialog. Fix: Missing selection highlight for the leftmost and topmost row of tiles in the map. Fix: Very rare race condition when activating pathfinding overlay. 2018.07.12 Fix: potential crash when displaying building placement overlay for a map with invalid tiles in use. Fix: Right click menu no longer enabled / disabled items depending on the active layer. 2018.07.11 Fix: sound file and AI script dropdown in classic trigedit did not work with unicode changes. 2018.07.08 New: Executable built with unicode windows support. Note: String contents are still encoded / decoded using the current system locale, for now ! Also, if any string conversion errors occur, please report them. New: Added support for mods with more than 16 player colors defined. 2018.06.30 Fix: Terrain selection was not reset in copy terrain mode, only in copy / cut / paste mode. Added: Doodad palette will now also display custom overlays. (e.g. impassible terrain. Fix: Terrain palette overlay now initialized correctly when additional palettes are created. 2018.06.19 Fix: Classic trigger autocomplete used switch action types for switch conditions and vice versa. Improved internal map window and message box handling. Added hotkeys for classic trigedit and briefing editor. 2018.05.30 Fix: Pasting a single build with odd height was offset incorrectly in cut/copy/paste layer. 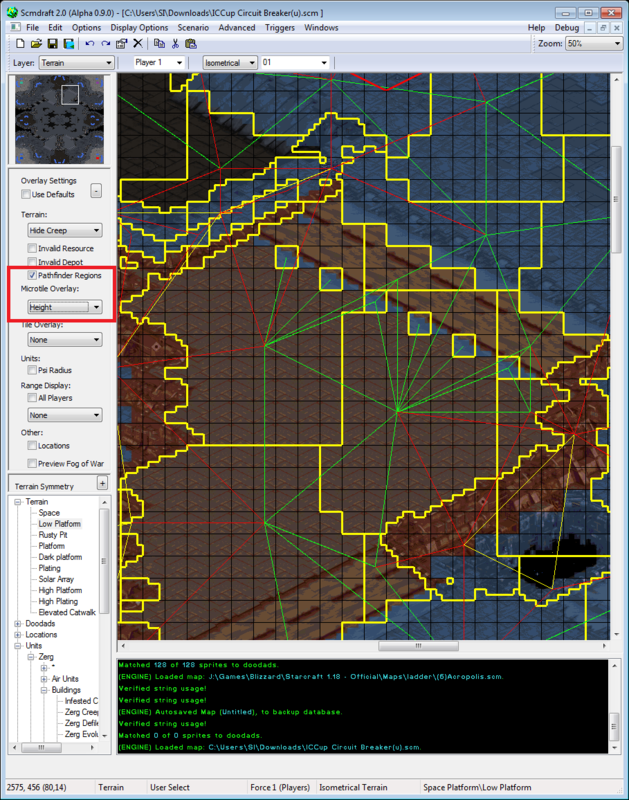 Reworked terrain selection and terrain selection outlining code. 2018.05.15 Fix: Scrollbar update was missing when scrolling with middle mouse button. 2018.05.08 Add undo / redo support to tileset morphing. Also improved doodad updating during morphing. 2018.05.01 Fix: When pasting an empty clipboard the clipboard occasionally was locked. 2018.04.22 Fix: After undoing all steps, the first step was not cleared during subsequent changes. 2018.04.02 Fix: crash when displaying unit health bars which are partially above the current viewport extent. Include the tech and upgrade ID for unlabeled techs and upgrades. 2018.03.17 Fix: crash when placing isometrical terrain on the bottom edge of the map. 2018.03.11 Initial 0.9.04 build ! Fix loading the ice tileset - removed overzealous error checking. Added briefing font color preview. 2018.03.09 0.9.03 Release Canditate ! - Please report anything that doesn't work as expected. 2018.03.08 0.9.03 Release Canditate ! - Please report anything that doesn't work as expected. Enable changing the type of existing trigger conditions and actions. Trigger parameter cache now caches data for the duration that a trigger is being edited, not just conditions or actions. 2018.03.02 0.9.03 Release Canditate ! - Please report anything that doesn't work as expected. Fix: Unit collision boxes were treated as exclusive instead of inclusive. Fix: Attempting to move the bottommost trigger down could crash. 2018.03.01 Fix: Copy+paste terrain brush used isometrical grid to determine whether it needed to apply changes. Fix: Work around windows bug with keyboard navigation in sorted dropdown controls. 2018.02.28 Fix: Korean language autocomplete editor sometimes broke. Fix: Unable to edit the default profile if it never had been used before. Cache the last used value of the 'Always Display Text' setting when adding multiple actions. 2018.02.27 Fix: Korean language autocomplete editor sometimes broke - this is only a partial fix! 2018.02.26 Fix: 'Always Display' setting for transmissions was not being stored. Fix: Avoid an error when creating the default profile during the first launch. 2018.02.25 Fix enabling ok button when a set deaths condition is auto-morphed to EUD memory condition. Fix: Autoselection of an edited trigger's player sometimes was run even if the trigger was visible. Populating the trigger list should be faster for large amount of triggers. 2018.02.22 Add additional error checking to classic trigedit, consolidate code. 2018.02.21 Improve management of 'Create Unit With Properties' property configurations. Fix: Do not attempt to calculate sound file length if no sound is set. 2018.02.19 Fix creep persisting for buildings present during map load. 2018.02.18 Add experimental 'Set Location Position' EUD action and condition. Various minor fixes to classic trigedit. Revert change to trigger player strings having two spaces before the index. Change EUD trigger detection algorithm some more. New trigger conditions / actions remember parameters when switching the condition / action type. 2018.02.08 Fix: Could not disable trigger actions. Various internal cleanup of trigger UI + data code. 2018.02.05 Fix: Invalid mineral area rendering did not take the scroll position into account. Fix: Could not change the sprite owner in the sprite properties dialog. 2018.01.15 Minor internal fog of war preview simplification. 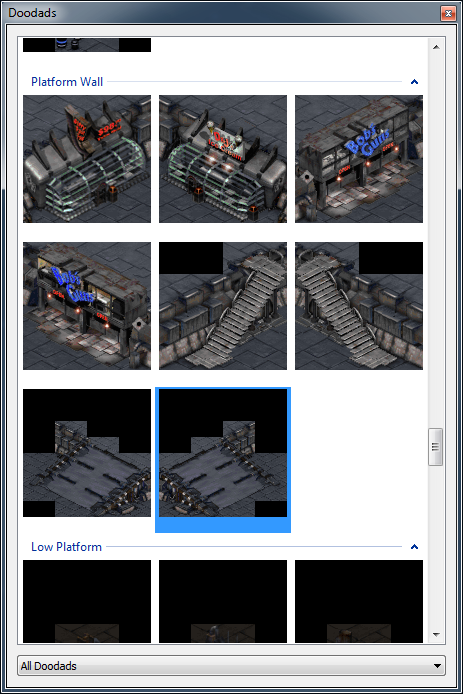 2018.01.12 Fix: An infinite loop may occur when switching unit types of damaged buildings. Fix: When switching all map unit types to start location, every other unit was being skipped. Change: Final changes to the terrain holder code. 2018.01.10 Add support for custom color cycling code. Fix: Improve parsing of integers in text trigedit to support a larger range of numbers in EUDs. 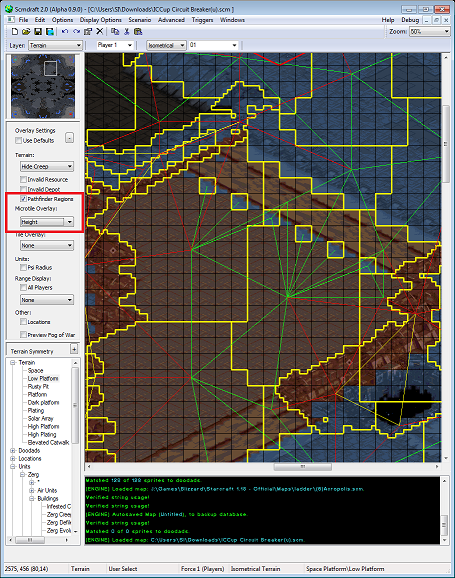 Change: More updates to the internal terrain handling code. 2018.01.08 Fix: Sprites of doodads contained in the brush were missing the sub-offset. 2018.01.07 Fix: dialog navigation hotkeys did not work in the edit trigger window. Fix: Fix a crash when exporting sounds. Fix: do not mark a map as changed on load when regenerating terrain. Fix: New triggers always show up in the trigger list in classic trigedit. Change: The expand/collapse state of the overlay and symmetry panels are restored on launch. Change: No longer require setting a condition or action when creating a new trigger in classic trigedit. Change: Improve color cycling slightly. Change: Simplify some internal tileset handling code. 2018.01.05 Fix: hotkeys were being filtered when a menu was active. Fix: Sprites could not be selected. 2018.01.04 Rework image renderer - among other things this should fix a few graphical glitches pure sprites are in the brush, and removes the limitation of 8 windows per map. Please report any remaining graphical glitches. Align expand / collapse buttons for the sidepanels. 2017.12.15 Fixed a crash when loading custom star.spk files with multiple empty layers. 2017.12.10 Added EUD action support to text trigedit parser. Enable keyboard shortcuts when the main window has focus. Changes to the internal startup order. 2017.12.09 Rework error / warning / info logger. Now all new error and warning messages are directed to the log panel at the bottom of the screen in addition to the console based logger. Modify shortcut handling for the main window - shortcuts work if the map window, overlay panel, symmetry panel, or map object tree is active. Added tab based naviagation to the main window. 2017.12.05 Fix: Resetting a specific upgrade's settings reset all upgrade settings. Changed splash screen - layout is slightly simpler, and splashscreen now does not close until the profile is configured correctly. Internal changed to setting and game data management. 2017.11.30 Fix: Crash introduced in additional error checking in build 2017.11.27. 2017.11.29 Fix: Freeze when editing unit X/Y positions. Enable tab based navigation in the palette windows. 2017.11.27 Fix: when the minimum required format of a map switched from Broodwar / StarCraft 1.05 to StarCraft 1.00, an error occured while saving locations. Added an EUD action to classic trigedit. 2017.10.24 Fix: when clearing a renamed switch the switch was not being set back to use default internally. Add preview of damage animations to buildings contained within the the current brush. 2017.10.21 Add preview of damage animations (i.e. flame / blood overlays on buildings). 2017.10.16 Fix: Changed rounding in terrain mirrored-symmetry modes to improve placement. 2017.10.03 Fix: Saving a broodwar (.scx) map could save bad version info. Fix: Resizing a non-square map incorrectly resized the terrain. Fog of War preview now is more accurate on ramps. 2017.09.04 Note: Replaces 2017.09.03 build with a fix for a freeze. Minor Feature: Use Shift or ctrl + arrow keys to offset the selected sprites. Minor Feature: Use Shift or ctrl + arrow keys to offset the selected location. Added 600% and 800% zoom levels. 2017.09.02 Fix: 'Modify hanger count' trigger action. Fix: Snap to grid swapped X and Y for non symmetrical grid. 2017.08.30 Fix: Parsing \< and \> sequences. 2017.08.29 Fix: Sprite properties window failed to open. Fix: infinite loop when removing doodads during tileset change. New: Location properties may be opened via double click on the map object tree. (And also capture enter in the tree control). Improve decryption key guessing during MPQ Optimize. 2017.08.27 Fix: Rearranging the rebar control didn't always toggle a layout update. Instead of closing when the selected profile is mis-configured, ask for the starcraft path explicitly. Internal updates to the backup database. 2017.08.23 Fix: Placing brush contents which contained both terrain and non-terrain objects only placed terrain. Prevented saving of maps which exceed the string text limit. 2017.08.22(B) Fix: Rendering triggers with empty comments attempted to display more text than fit in allocated space. Fix: A few minor user-defined brush palette issues. Fix: Occasionally read too much data when parsing string color codes. Fix: Keyboard shortcuts were being intercepted in non-modal subwindows. Updated auto-update functionality to have working fallback code if ScmDraft did not have write access to the working directory. 2017.08.12 Fix: Map revealers weren't being created hidden when loading a map. Remove setup-like functionality from the advanced menu, due to UAC restrictions. File associations are now done by the optional setup. 2017.08.11 Fix: Upgrading a map from starcraft to broodwar was not remembered, triggering save as on every save. Fix a crash when trying to display hitpoints of hidden units. Avoid an error message during debug logging of load of maps with unicode chars. 2017.08.10 Modify MPQ code to support unicode paths. (e.g. korean map filenames). 2017.08.09 Add sub-categories to the user-defined brush palette. Fix a few minor graphical glitches. Fix a potential crash during close. 2017.08.07 Add support for *.ogg sound files, and minor sound code cleanup. 2017.08.06 Brush palette now uses currently active terrain overlay settings. All sub-windows now open centered on the main window. Fix redo command instead triggering undo. Fix fog of war preview settings not refreshing the screen. Fix occasional missing updates of creep tiles after terrain was changed. Fix snap to grid for location resizing. Saving a user-defined brush collection now updates the file name. Cleanup of map data save + load code. Cleanup of screen invalidation events. 2017.07.30 Fix a few remaining DPI scaling issues. 2017.07.29 Implement a fix for classic trigedit under WINE. Enable Hi-DPI scaling after updating last incompatible UI elements. Known issues: Some toolbar dropdowns are offset by a few pixels. The 'Save Map Image' icon is not being enlarged. Please report any other windows or items which are not scaling correctly when using DPI scaling. 2017.07.28 Add additional debug logging to classic trigedit. 2017.07.27 Fix a potential crash in the faster masking code added in previous release. Add additional verbose error messages when unable to locate the game data. Add additional debug logging to classic trigedit. 2017.07.24(b) Replaces initial 2017.07.24 release! Fix a crash when unloading a brush collection. Prevent placing the brush contents multiple times on the same tile when moving the mouse during click. 2017.07.23 Doodad Palette; Unit Palette; Sprite Palette; User-defined Brush Palette: Update windows to use a grouped listview instead of a listbox. Items are now inserted in collapsible groups. Item preview size may also be changed using the context menu. Sprite Palette: Rework filtering functionality - Now whenever a group of sprites is displayed, all subgroups of the selected group are also displayed. User-defined brush palette: Add support for deleting and renaming brushes. Core Engine: Add support for *.vr4ex mod files. 2017.07.21 User-defined brush palette: Improve rendering, preperations for renaming and deleting brushes. 2017.07.19 Fix: Classic Trigedit: Infinite loop when attempting to duplicate the 64th action when all actions are used. Brush palette now supports unloading files, and renders sprites and units as well. Still not complete ! 2017.07.18 Fix: Classic Trigedit: Unable to set resource amount in set unit resource amount action. Fix: Undoing convert doodad to terrain didn't revert terrain tiles correctly. New implementation of the brush collection manager and the user-defined brush palette. Very preliminary and incomplete !!! 2017.07.12 Improve classic trigedit window resizing logic. Avoid an error when saving an edited string if the filters do not include it. 2017.07.11 Potential fix for trigeditplus and empty strings. Located and destroyed string corruption bug when deleting all triggers using text trigedit and subsequently compiling multiple times. 2017.07.09 Terrain palette now displays currently selected active tile and microtile overlays. 2017.07.04 Fix missing pathfinder update when changing 1x1 sized terrain blocks. 2017.07.03 Fix delayed minimap update on unit placement. Fix a bug with exporting and importing custom brush files. Add option to debug menu to open the debuf console output. Fix terrain object brush leaving clutter on screen. 2017.06.29 Fix classic trigedit sometimes switching trigger and briefing mode introduced last build. Internal arbitrary selection brush rendering changes. 2017.06.26 Fix doodad cursor offset error. Fix select 0x0 tile size render hang. Experimental change for older richedit versions for classic trigedit. 2017.06.24 Rework cursor display for all internal editor states. 2017.06.23 Fix powered protoss building display. Add double click on unit sprites to toggle active state. Continue reworking internal editor state state machine. 2017.06.18 Move and expand terrain symmetry options; These may now be found in the left panel below the overlay settings. Fix an issue with determining sound file lengths for the transmission trigger action. Add batch sound import function to the map sound manager. 2017.06.13 Add option to make unit range display player specific. Add first version of unit vision range and detection range display. Fix arrow keys not scrolling the map. 2017.06.11 Implemented unit attack range shading. Fix upgrade player-specific checkboxes storing inverted values. Rework custom grid dialog slightly to support DPI scaling. 2017.06.10 Added rotational terrain symmetry options. Fix missing scrollbar update after changing the zoom level. Optimize performance of terrain placing slightly. 2017.06.08 Fix delayed creep update during unit editing. Fix delayed fog of war update during terrain editing. Update minimap rendering to match in-game minimap. 2017.06.07 Implemented pure sprite palette. 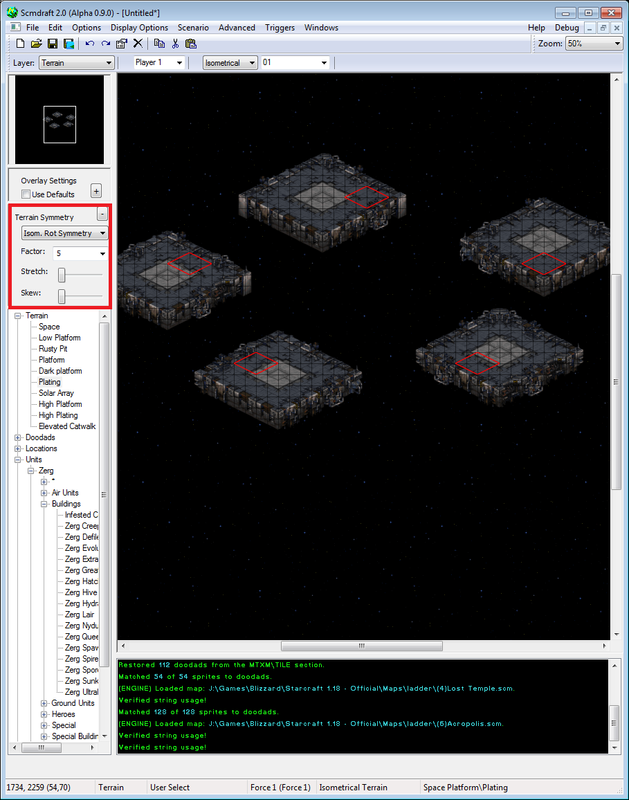 Extended unit palette to toggle between units and unit sprites. Added a primitive and incomplete unit range indicator. 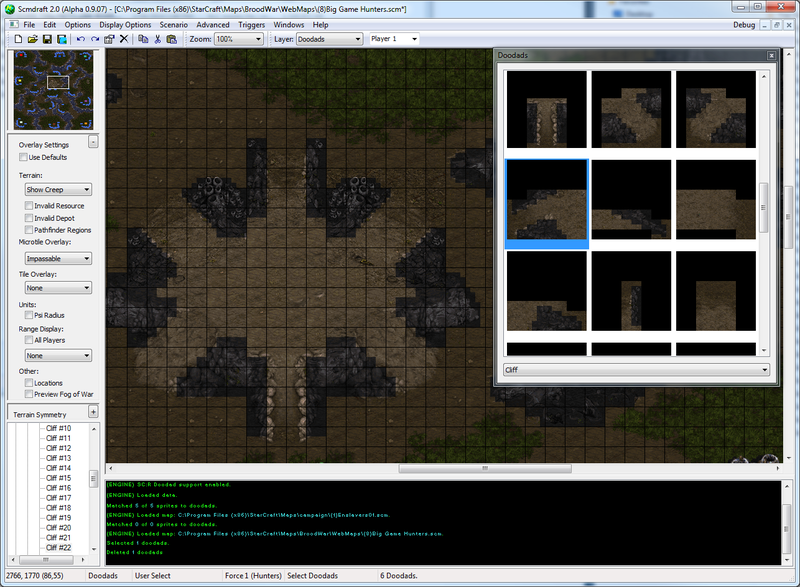 Overhaul sprite, terrain, initial fog of war code. Fix a few issues that arose during unit code overhaul. 2017.05.29 Completely overhauled all unit related code. (Loading / saving units. Placing units. Unit undo / redo. Selected unit set management. Map unit properties window. Now all unit changes done in the properties window should be un and redoable. 2017.05.21 Add option for transparent creep rendering. Remove overlay options from the menus which are now in the overlay panels. Optimized (or maybe broke) doodad handling. Improve tileset palette resizing. Now allows 2:1, 3:1, 4:1 zoom etc. 2017.05.17 Minor adjustment in fog of war preview calculation. Avoid resetting active layer on map switch. 2017.05.16(B) Potential fix for rare crash on map close. Improve (but not perfect) minimap unit rendering. 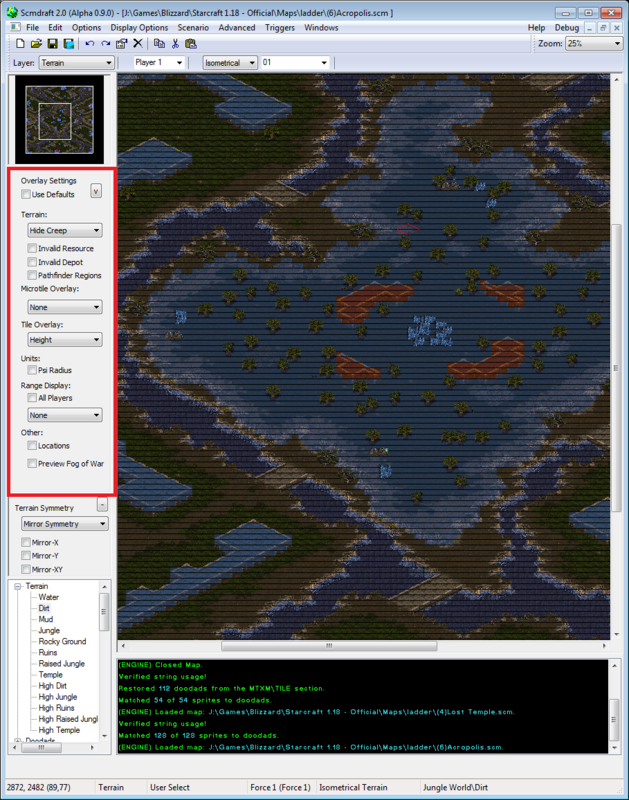 Add +/- hotkey support (change brush size) in the fog of war layer. 2017.05.15 Initial publicly available 0.9.0 build.